Meditation has many levels, but on the most profound level we can say that mediation is using the mind to skillfully and subtly recognize the essence and true nature of your mind. 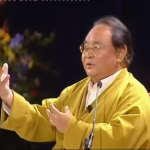 In this is the second half of that talk, Rinpoche explains the deeper aspects of meditation as a way of bringing the mind home, and how we can bring that simplicity, spaciousness, and humor we discover through meditation into our daily lives and activities. You can find the first part of this talk here.